I use to do climb milling almost all the time, without any issue. Up to this day. 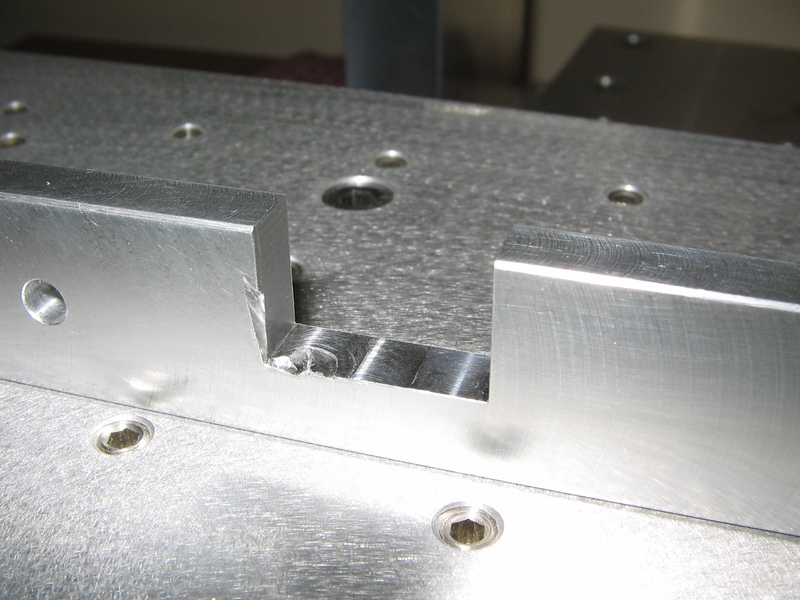 Seems it’s widely known that climb milling can be dangerous if you have backlash in your machine. Well, this was not the case. After I broke the 5mm endmill in the picture I’d found the knobs (both) where pulled out of position by about 0.5mm. Maybe my fault; previously I had disassembled the whole crosslide to clean and install delrin nuts. 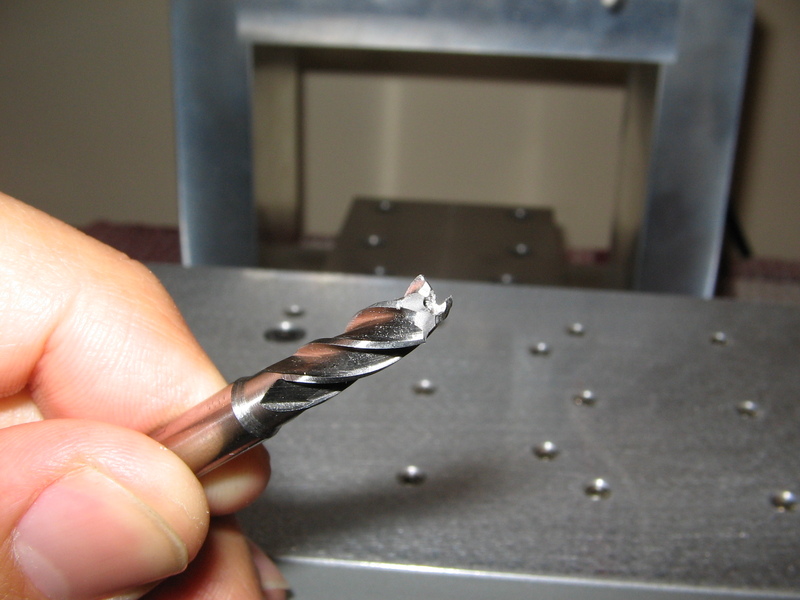 A bit later I continue, using 1/4″ three-flute carbide end mill. I don’t remember very well, but I was about to take about 0.3mm on the side, climb milling again. I begin ok, but suddenly, when the endmill was about to exit, the thing grasp into the corner and get stuck into the part. The tip of the endmill was out of position by about 2mm; a rotation in the headstock, purely by flex of all the parts of the headstock and column, was evident (maybe 1º). After unstuck the endmill from the part, the headstock return to his position. I was a bit shoked and forgot to take a picture. Luckily the endmill didn’t break, and there was no damage in the machine (picture doesn’t show original part damage, just a fraction). Thinner endmill. Usually I use a 3/8 endmill for side milling. Two spacer blocks and a long ER16 chuck, giving a less rigid setup. Cutting both on the front and on the side (6x11mm). Less tight gibs. Previously it was not so easy to move the free carriage with the hand. The good thing is that when things like this happens, you can go to Youtube and check videos like this, and feel a bit better. One last thing…. now I’m convinced that an accelerometer-based automatic stop is a MUST on any cnc. Thanks for sharing. I used to face this sort of misadventure. Mill cutter got stuck in the job and the headstock and saddle moved. The main reason, Sherline mill headstock stock comes in 3 parts (with extension stock). They’re joint by keyways and taper bolts which are not very secured. I copied E2Z concept using a block to hold all 3 blocks together. Then onwards, never have I encountered this again. Also both my x and z axis of machine table are governed by 2 lock nuts on either end of each axis to snug up the gibs of any play by finger pressure while milling. This way any uneven wear is overcomed. Hence, manual milling is a breeze now. By theory, climb milling is not encouraged as it will pull the job along the cut. Thanks for the info, thank good I’m not the only one. Finger activated lock’s seems a wise idea; I used to use X and Y lock a lot (using a hex bolt, though). My new cnc machine has the headstock fixed using four hex screws because I was also suspicious about taper bolts. I use to do climb milling because of less power required, better finish and quieter cuts (and supposedly less tool wear), but will be careful hereafter.